Superman 423 & Action Comics 583 combined are two of my favourite comic books. Written by Alan Moore. 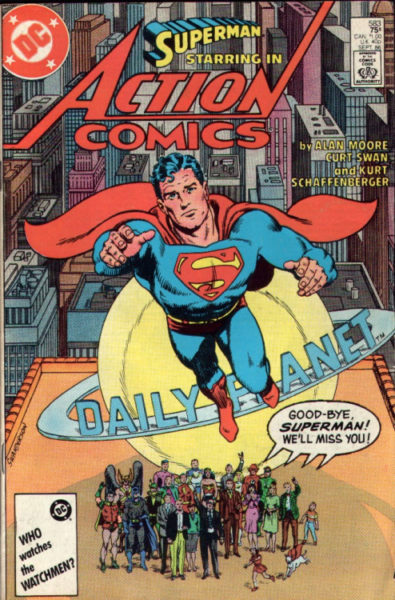 Illustrated by Curt Swan, Kurt Schaffenberger and George Perez. Edited by Julius Schwartz. Why would these two books be my all time favorite comic books? It has Superman in it! And I love Superman! I grew up reading the Cary Bates, Curt Swan and Murphy Anderson stuff. And also, I love Alan Moore… okay not him personally but his writing. What made this even better was Curt Swan pencils with George Perez inking it. Need I say more? This two-part story had everything and everyone who ever was related to Superman in one way or another in it. From Lana Lang, Lois Lane, Krypto, Bizarro Lex Luthor, Metallo…. The story was simple and complex at the same time. Reading the story you could tell that Alan Moore put his heart into it. He wanted to do this. John Byrne had signed on to write and pencil the re-launched Superman, beginning with The Man of Steel mini series that went on sale in July of 1986. 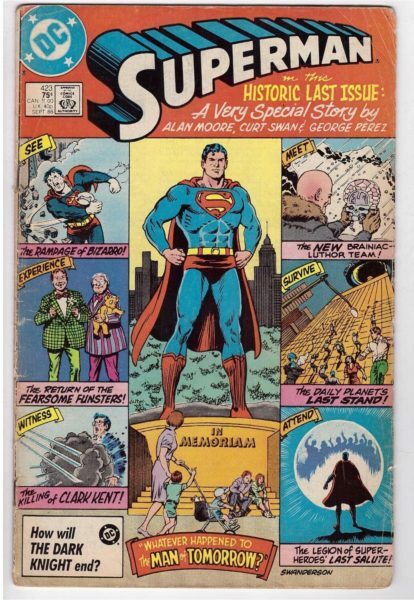 This left Superman editor Julius Schwartz with the opportunity to do a grand finale for his stewardship of Superman and Action Comics. Julius Schwartz wanted to get Jerry Siegel to write it. But it turned out there were legal problems that, because of schedule, we didn’t have time to resolve, so Jerry wasn’t able to do it after all. The story was a great tribute to the history of Superman.